Stage 9 of The Kerry Way long distance walking route from Kenmare to Killarney or vice versa is known as the Old Kenmare Road. 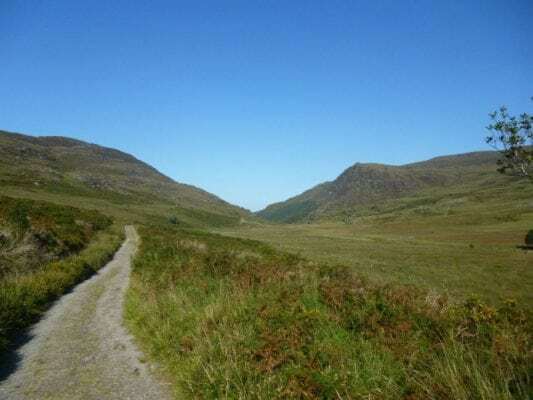 This is a moderate to strenuous 5 to 8 hour (24 km) walking route through amazing scenery and the Killarney National Park and has a number of steep and steady climbs and descents. A shorter 9km (3 hour) section of this stage from Torc Waterfall to Galways Bridge is also popular. The Kerry Way is a long distance walking trail in County Kerry, Ireland and the longest of Irelands National Waymarked Trails at approximately 215 km (134 miles) long. The walking route officially begins and ends in Killarney but you can join the trail at any number of points along its length. The Kerry Way takes in the entire Iveragh Peninsula in an anti clockwise loop and is the walking alternative to the world famous Ring of Kerry scenic drive which follows a similar route. Typically the entire route is broken down into 9 key stages of approximate equal length or duration. We have also broken some of these longer stages into smaller part to allow everyone irrespective of fitness or time available to experience one of the best and varied walks in Ireland. Use our Map of Ireland and Sat Nav tool to get directions to any of the stage start points and our detailed maps and GPS on our ActiveME App to find and follow the walking route live on screen and keep on track.